For all of his accolades as the cardinal developer in Boston’s thriving Seaport district, John Drew instantly relinquishes acclaim to those who advised and encouraged him throughout his 30 plus years of planning - long before the “Innovation District” was slightly more than a slew of parking lots and abandoned warehouses. “I am very fortunate to have partnered with so many brilliant financial professionals, who hold your feet to the fire and expect results,” says Drew. John Drew, the CEO of the aptly named, The Drew Company will become the 28th recipient to be decorated with the REFA honor, and be presented with the Boston Harbor Bowl, a signature piece requisitioned by Shreve, Crump & Low. “This (award) is coming from the professionals who walk around town with a very tough job of analyzing and evaluating projects, and they need to make good decisions - so I’m honored to be in their company,” adds Drew. A native of South Boston, Drew’s local roots lend deep credibility to, “All politics are local” and “location, location, location.” You might say his career played out with an amalgamation of a part real estate developer, part politician - but so goes the role of a developer. However, this is a man who grew up less than a couple miles from what would become one of the most active and profitable real estate investment blocks around the globe. Surely he didn’t see that coming? It’s a story of humble beginnings, back in a time when developers weren’t raising funds and traveling abroad, telling the story of Boston’s real estate riches, to harvest the capital needed to make a project fertile. “It’s a different game, and a much better one now. Back then it was very hard to get financing and much tougher to develop in many areas around Boston, and the Seaport, in particular, had many restrictions, Drew retrospects. He talks of high energy, positivity and forward thinking as traits that kept him at the table on all the work he has undertaken, and all that he still projects to achieve; in a city that Drew says came a long way in a short period. “This city has done a complete one-eighty. We’re the youngest major city in the country, with a growing population, a much safer environment, providing the best in technology, medical and education ... and constantly moving forward.” That, from a man who grew up in the days of “not in my backyard.” “Oh, I remember all too well the worries of new development and bringing outsiders into Boston neighborhoods, not just from the politicians but from family and friends, but I’ve always embraced change and always push forward to the next thing,” lauds Drew. It was his trust with a band of many local forward thinking leaders, such as Fidelity’s Johnson, Mayor Kevin White and Massachusetts Representative Joe Moakley that he attributes his ability to building bonds (both in the literal and figurative sense) between public and private partnerships, and championing the efforts to raise the ground of a desolate area. “I think you need to work both sides and have a good mix ... I’ve enjoyed working on and building the vision of the next generation from developing with public-private partnerships, and as it turns out, these are the traits that allowed the Seaport to happen ... but it’s all about fact-based programming that financiers and city and state government need to have the vision for and buy in,” Drew modestly adds. 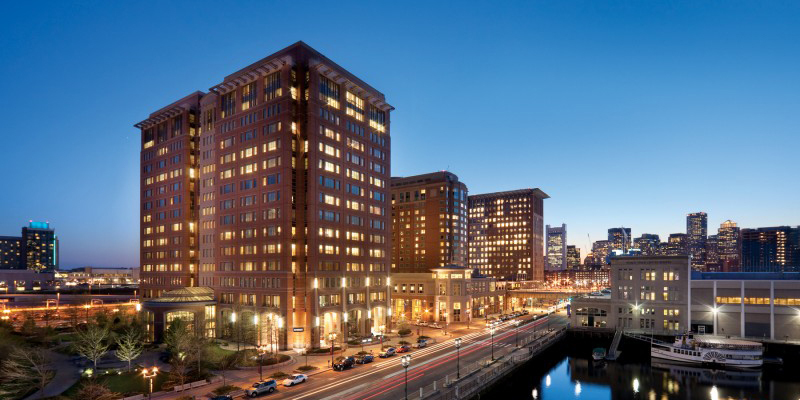 He is heralded as a true visionary leader in his development of the Seaport Companies: Seaport Hotel and World Trade Center Boston, Seaport East and Seaport West, where (Drew says) will always be called home base. Yet, his expertise on public-private partnerships is not confined to the old neighborhood. The Drew Company’s portfolio retains other US and international holdings; with developments in Washington, DC, his second major trade center project in the Ronald Reagan Building and International Trade Center, which opened in 1998, and Dublin, Ireland with the World Trade Center Dublin (2010). Within the development portfolio includes assets that Drew no longer holds, but has local pride in The Tweeter Center for the Performing Arts (Now Xfinity Center), Bayside Exposition Center and Constitution Plaza in Boston. 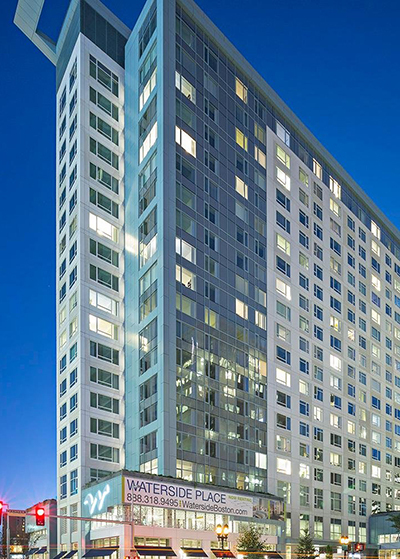 His most recent development under the current portfolio is just a glance away from his office window, with the recently opened (2014) and 97% occupied (he proudly adds with a smile) Waterside Place, a 236-unit mixed-use luxury rental apartment building, in the Seaport. It is his keen attention to detail and affection for people which John Drew will be awarded for when he takes the stage as distinguished honor and recipient of the Swain Award at the Westin Copley. An evening that even he may not have envisioned. The Real Estate Finance Association (REFA), a division of the Greater Boston Real Estate Board (GBREB), is a commercial real estate business association providing members with high-quality networking and educational opportunities. REFA strives to maintain its reputation for excellence by promoting the exchange of information between professionals in the real estate finance community and fostering a platform for growth and development for its Emerging Leader membership. REFA hosts 30 events per year, including speaking programs with industry leaders, the 500 people Annual Gala and networking events. REFA is committed to giving back to the community with the Annual REFA Charitable Golf Tournament and community service activities.